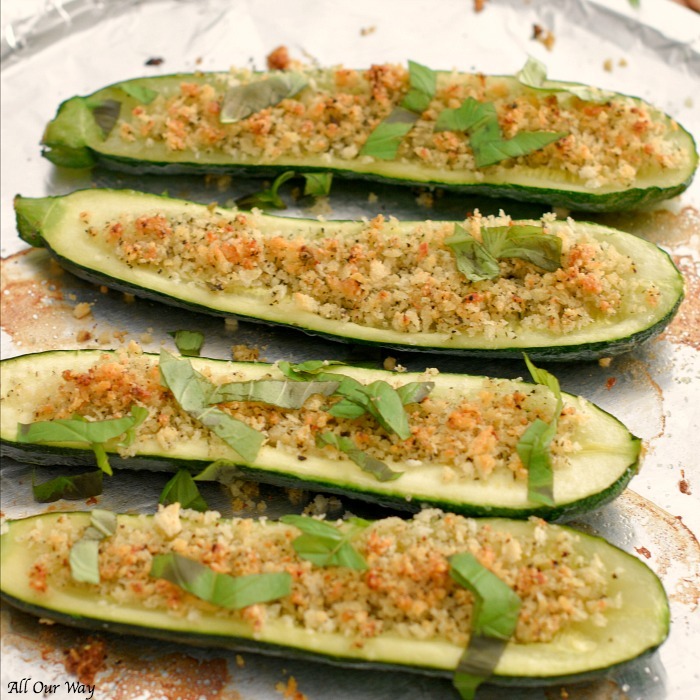 Roasted Zucchini Stuffed with Parmesan Garlic Breadcrumbs is the perfect answer. It’s a tasty and easy solution for feeding a few or a crowd. Do you search for an easy vegetable recipe you can assemble ahead of time? This recipe is just for you. For this baked squash recipe, you’ll need small, thin, straight zucchini. They should be dark green on the outside and feel heavy for their size. Leave those humongous gourds that our friends and neighbors like to share with us for bread, muffins, and casseroles. You know the size squash I’m talking about, the one full of seeds that are as big as pumpkin seeds. Bless their hearts, but the poor gardeners need to rid themselves of those squash and who better to give to than a neighbor without a garden? Zucchini seems to multiply overnight, and they have to get rid share their bounty. High Source of Antioxidants and Vitamin C and B. Has anti-Inflammatory Properties that can improve heart health. Phytonutrients that helps maintain eye health. Low in calories and carbs. To tell you the truth, before I looked up the nutritious value of zucchini, I thought it was pretty ordinary, just like beets. Was I ever wrong! Wash the squash and trim the stem end, then cut them in half lengthwise. Scoop out the small channel of seeds with a teaspoon. Place the zucchini in one layer on a sheet pan covered with foil. Brush the inside of the zucchini with olive oil, and turn them cut side down. Sprinkle with salt and roast for 12 to 15 minutes. While the zucchini boats are cooking, make the breadcrumbs. In a medium bowl combine the garlic, parsley, basil, Parmesan, salt, and pepper. Add the panko and the olive oil. Mix well. Add the panko and the olive oil. Mix well. Test the zucchini doneness with the tip of a knife. The squash should be tender but still firm. Turn the zucchini cut side up and spoon a heaping tablespoon of panko mixture evenly on each squash boat. Bake for another 8 to 10 minutes, until the panko is crispy and golden. You can serve the roasted zucchini hot, warm or at room temperature. 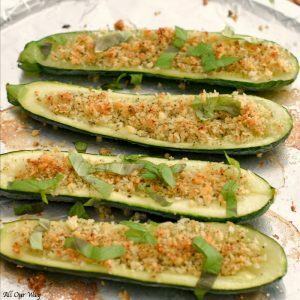 A platter of Roasted Zucchini Stuffed with Parmesan Breadcrumbs will look beautiful as part of a buffet or simply, as a special weeknight vegetable. What a delicious way to enjoy zucchini! Next time someone gives you a box of zucchini, or even if you purchase them at the Farmer’s Market, forget the cakes, muffins, and casseroles, and try this easy recipe that is full of flavor with lots of texture. After all, if it’s one of Ina Garten’s Jeffrey’s favorites, from Cooking for Jeffrey, it will be one of yours too. Let’s stay connected. Be sure to sign up for our weekly newsletter. 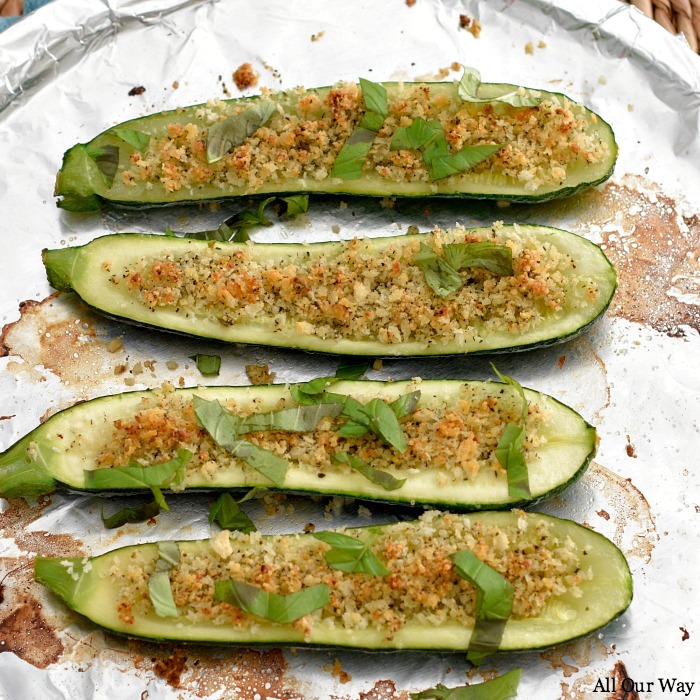 An easy zucchini recipe that has lots of flavor and texture of toasted breadcrumbs on top. It can be prepared ahead and roasted just before serving. 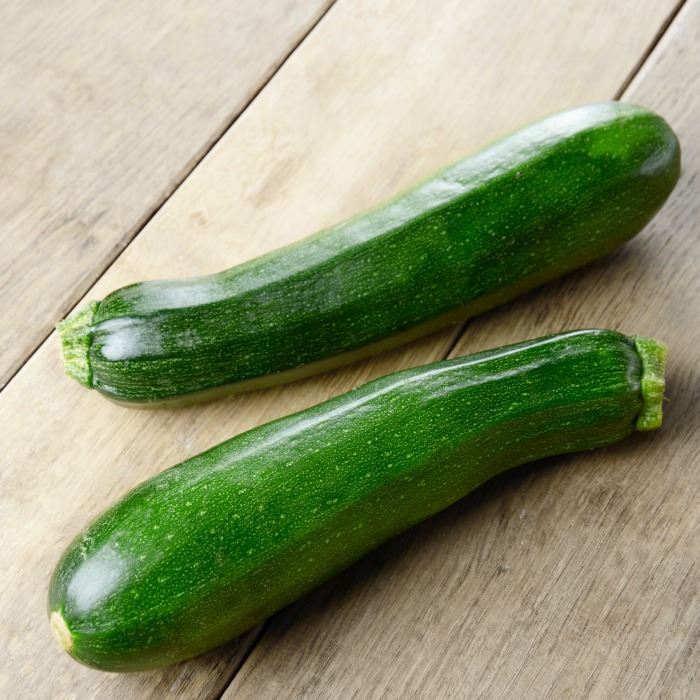 Trim the stem end of the zucchini, cut them in half lengthwise, scoop out a small channel of seeds with a regular teaspoon. Place the zucchini in one layer on a foiled lined sheet pan. Generously brush the inside of the zucchini with olive oil. Turn cut side down and sprinkle with salt. Roast for about 12 to 15 minutes, until just tender but still firm when tested with the tip of a small paring knife. While the zucchini is roasting prepare the breadcrumbs. In a medium bowl, combine the garlic, parsley, basil, parmesan, 1/2 teaspoon salt and 1/4 teaspoon pepper. Add the panko and 2 tablespoons of oil. Mix well. Turn the zucchini cut side up and spoon a heaping tablespoon of the panko mixture evenly on each zucchini. Bake for another 8 to 10 minutes, until the panko is crispy and golden. You can prepare the zucchini and the crumb mixture separately and refrigerate for up to a day. Roast before serving. You’re taking me back to my grandpa’s garden with this delicious-looking recipe! He used to grow his own zucchini (and tomatoes) and one of the ways my grandmother (Nanny) used to prepare them was by stuffing. Such a simple and delicious way to enjoy zucchini. A warm and nostalgic taste of summer for me! Will definitely be making this soon! Hello, Amanda! Certain dishes do bring back memories, don’t they? I love the idea of remembering precious times we spent with loved ones. Such a tasty, wonderful side dish for the summer! 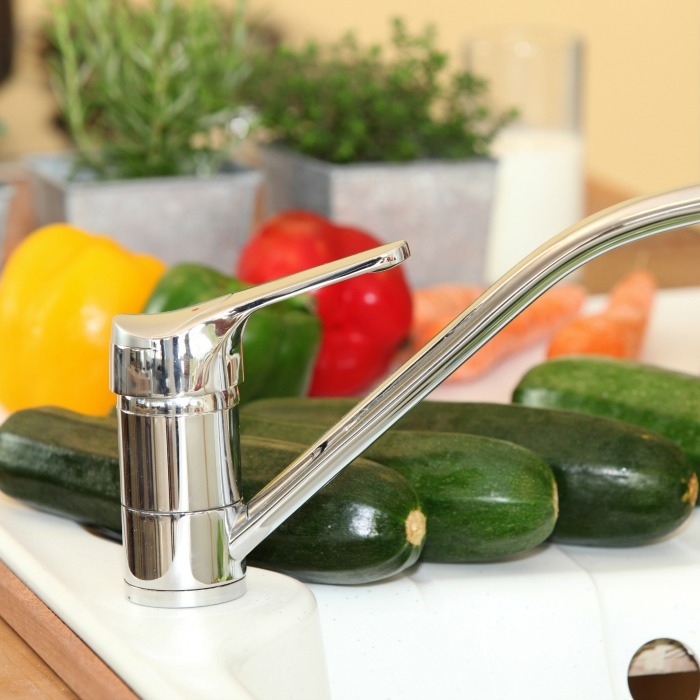 It’s so amazing how much zucchini one plant can produce and this is a great way to use it! I love the addition of basil in the stuffing! Thank you, Amy! It’s a great company side because you can prepare it ahead of time. Ooh yum, these sound amazing! I am one of those neighbors ‘getting rid’ of my bounty every summer 🙂 I am hopeless at keeping up with my zucchini, they grow so fast!! This is a great recipe to have in my repertoire! Oh this is a great ‘back pocket recipe’. I love this idea for using up zucchini, it’s easy and fast. I haven’t tried this before and i love zucchini. Thanks for sharing this! Hi, Tina! You’ll love the recipe — so easy and can prepare it ahead. Oh my goodness. I’ve never been as inclined to make zucchini boats as I am right in this moment. These sound unreal! I just can’t turn down garlicky + cheesy carbs. It’s impossible. These would make for a great veg side for summer grilling. Hi, Dana! They are great tasting and easy to prepare ahead and then bake. We’re on the same boat! Our neighbour grows zucchini and sometimes a zillion seems to pop up overnight and that’s how we end up with a ton of zucchini ourselves. I usually spiralize my zucchini so I’ll have to try roasting it next time around. Hello, Carmy!! It is a wonderful way to use all those veggies. Our family loves this recipe. I haven’t tried growing zucchini yet, but I almost always get “gifted” a ton of it in the summer! What a great idea to make little cheesy boats out of it!! I love roasted veggies- this made me so hungry! Hi, Sarah! Why grow them when you have such generous gardeners around you. Zucchini is so plentiful that I can see this recipe becoming one I put on rotation often. I love that crunchy golden topping. It definitely takes it to the next level of delicious. YES….zucchini season is approaching. 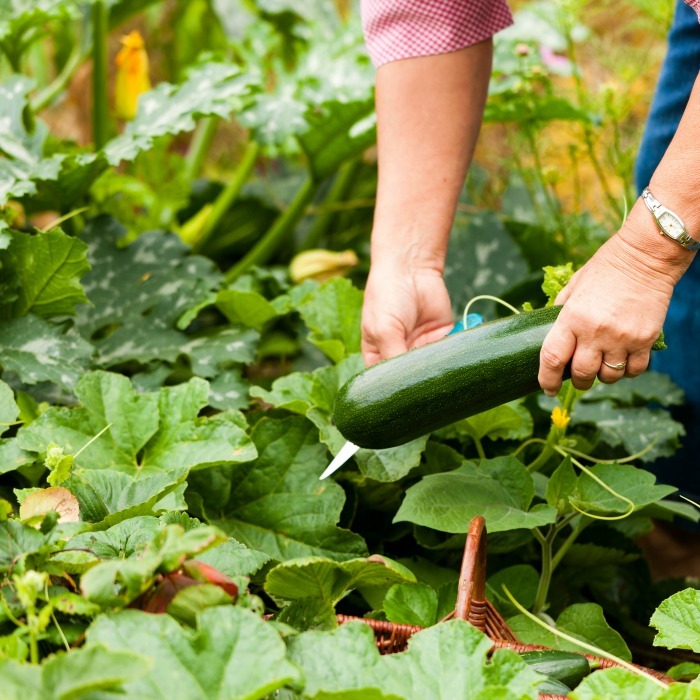 You can never have too many recipes….especially if you grow them in your garden. This recipe sounds delicious and the perfect way to enjoy them. These would work as a great side dish…or even an appetizer. Thank you, Jeannie! Let me know how you like them. A totally simple but elevated way to use and eat zucchinis! Looks great! Thank you, Kristen. Picked up some more zucchini this morning. What a great way to use zucchini! Love that you can assemble them ahead of time, too! Hi, Ashley! I thought that was a win-win too. Have a large gathering and get most of it done ahead. Zucchini, one of my favorites. Thanks for the recipe Marisa ! Ciao, Will! You’re welcome. If it’s one thing I do enjoy, other than cooking, is sharing recipes we love. I have a black thumb and rely heavily on my friend who can grow herbs like nobody’s business! I get all kinds of basil and mint from her! I am a huge fan of zucchini and these boats look amazing!! Not only would they be a great side dish but I can eat this as a main dish!! Hi, Jennifer! You sure could eat them as a main dish — add some cheese for the protein. YUM! Some veggies do surprise you, right?! You think it just a plain and simple veggie, but it turns out it’s a blast for our health 🙂 I love zucchini very much and when the season starts I can’t stop eating it… I even eat it fresh in my salads. These delicious veggie boats are just perfect. Amazing Italian flavors are going on there, and I just can’t resist it. Must try! Thanks for recipe Marisa. I was really surprised at all the health benefits. I knew as a veggie it was good for us but I didn’t realize how much. 🙂 And you are most welcome for the recipe. I like cooking with zucchini, it is one veggie my little girl won’t refuse, she can be so picky. Garlic works beautifully with it, and roasting is the best way to get the full flavour. Hi, Daniela! Isn’t it great when we find something our kids love and is good for them? This recipe is a keeper! What a fabulous and quick recipe. I totally love it and would definitely try this soon as weeknight dinner. I love zucchini and this sure looks healthy n yum! Hi, Molly! I’m anxious to make it again, it was that easy and good. I grew cucumbers in my garden once and I said never again after I had 1. Too many and 2. some of them the size of footballs. However, I love zucchini so much, I’m tempted to grow it in my garden but I’m so afraid of having another cucumber fiasco on my hands, LOL! I love your version of stuffing them with garlic breadcrumbs. So simple, but delicious and easy! Love stuffed zucchini! So good and perfect for spring/summer. Definitely want to try this one out! Saving for later! Hi, Christine! The recipe is just right for warmer weather, very light but oh so tasty! I will be happy if my neighbor knock at the door and give me this fresh Zucchini. Love your simple recipe and even my kids will love it. Oh my God, you are so lucky! I would never, NEVER, complain about free zucchini showing up at my door! 🙂 It might totally be a coincidence, but I swear I saw this recipe in Ina Garten’s new cookbook just yesterday. It looks so delicious and so simple too! You are absolutely right, Byron. It is Ina’s recipe. I gave her credit in the post and the recipe itself. I love her recipes. They are very simple but so delicious. I can’t wait to make more of her recipes. This is the perfect little side dish for so many different recipes. When zucchini season is here, you need lots of recipes to keep using them up. Perfect for grilling season. Thats so much fresh produce there…those zucchinis looks so fresh and green, Must be so exciting to cook with fresh ones right from the garden right, even if it happens to be your neighbours..:)..the roasted one looks so good with all that filling. 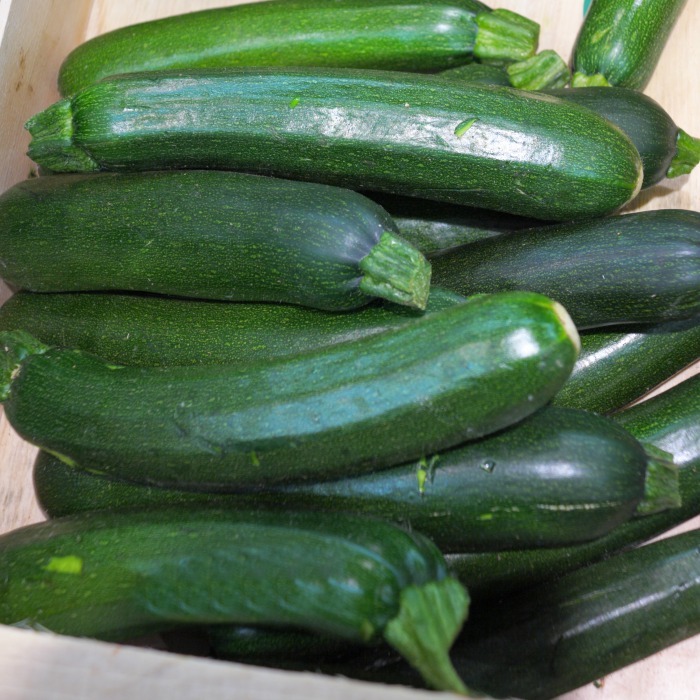 I simply love the zucchini that are right from the garden or fresh from the Farmer’s Market. The roasted zucchini are delicious and so simple! YUM! I love zucchini boats. They make a really special side, especially with the crunchy crumbs! Hello, Kylee! Yes, zucchini boats can hold so many delicious fillings. They do make a great side. I love making things like this with zucchini. It’s so easy to grow zucchini around here. I have some in my fridge, I should give this a try tonight for dinner! Hello, Reesa! If you make the zucchini, let me know how you like it. Hi, Ross! Thank you for sharing the recipe with your daughter. The nice part about making the zucchini you can make it for one or more. I like that it doesn’t take much – those ingredients I always have on hand. What a lovely idea for a brunch! I love cooking with zucchinis- they are such a forgotten vegetable but the best when it comes to taste! Hello, Hanady! I really didn’t know zucchini had all of those health perks to them. Yes I will be eating more of them. 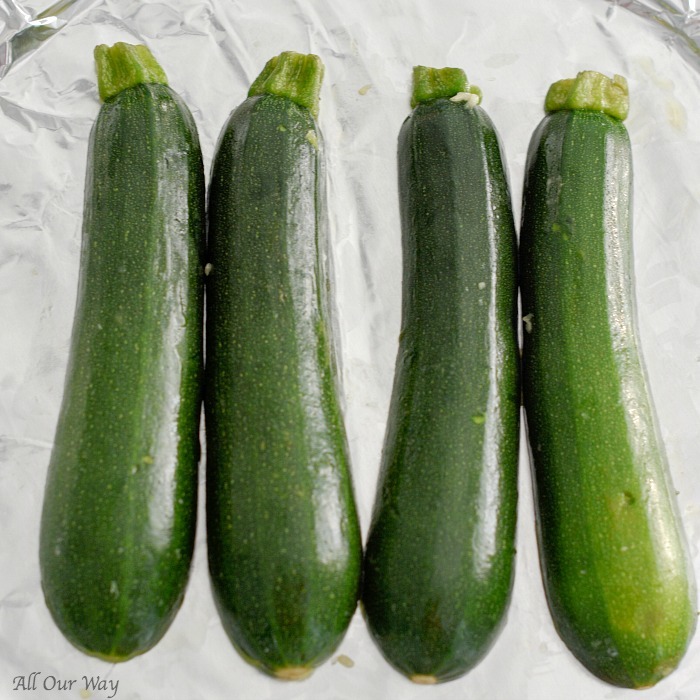 I first learned all the different ways you can use zucchini because I worked in an area where a lot of people had small farms or large gardens. I would come home everyday with a box of zucchini or squash and had to figure out how to use them all. I would love these boats for dinner! Hello, Meg! Well, lucky you with a box of squash. Since learning about their nutritional value we will be including them more in our meals. Zucchini is such a versatile vegetable. I love roasting it like this too and stuffing it with different meats, cheeses, and seasonings. Yum. Hello, Anya! I love all of the stuffings you can make for the zucchini. Hubby and I are trying to watch the calories so we decided to keep it simple. It was simple but the taste was fantastic. I didn’t know zucchini had all those health benefits. I love Ina’s recipes and I look forward to growing my own zucchini this summer so I can make this. That’s great that you’ll be able to grow your own zucchini. If you get too much I can always run over and take the burden off your shoulders. 🙂 Buon fine settimana, Linda. What a great dinner idea! I don’t think I’ve ever roasted zucchini before. Thanks for the inspiration! Hi, Amy! You won’t be disappointed in roasting them. In fact, I’ve sprinkled some mozzarella cheese in the boat along with some grape tomatoes. Thank you, Veena. The breadcrumbs do add that special something making it extra tasty! Marisa, this sounds wonderful. Especially as a colorful and nutritious side dish for a large group. Must try it soon. Ina is my favorite chef also. This is my favorite way to serve zucchini. Your recipe really makes this vegetable shine. Lots of helpful information in this post also.